Concern about many of the pesticides used to maintain the turf at golf courses exists because of the possibility of contamination of nearby fresh water sources and tap water. The "Provisional Guidance Indicators for the Prevention of Water Pollution from Pesticides Used in Golf Courses" was originally published by Japan's Ministry of the Environment in 1990. 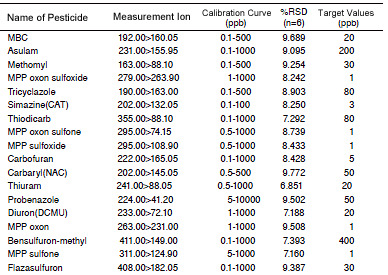 In a related notification issued on September 29, 2010, indicator values for 72 pesticides were specified, and 44 pesticides were targeted for evaluation using LC/MS. 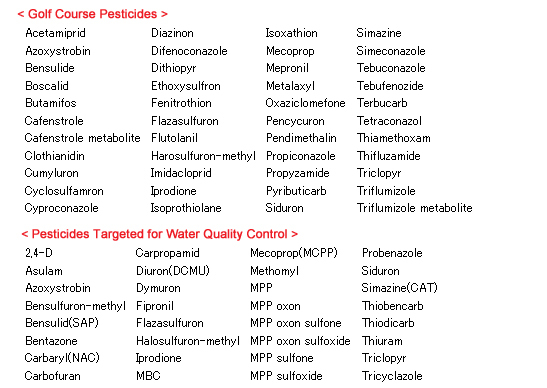 In this method package, analytical conditions and compound data are registered with respect to golf course pesticides (44 pesticides), and pesticides targeted for water quality control (30 pesticides excluding oxine-copper, plus simazine and tiobencarb, for a total of 32 pesticides). This package enables analysis without the troublesome process of investigating the separation conditions required for LCMSMS analysis, or optimization of the MS parameters for each of the target compounds. As a result, batch analysis of multiple components can be efficiently performed. Measurements of golf course wastewater were performed. MRM chromatograms (simazine, diazinon, isoxathion, and triflumizole as examples) are shown for sample solutions (no standard samples added), and sample solutions with either 10 μg/L or 50 μg/L of standard samples added. In the wastewater used here, no pesticides were detected. However in the sample solutions with the standard samples added, the concentrations at 1/3 to 1/10 of the indicator values were all detected with excellent S/N ratios, and no interference from contaminating components.